For some reason, my post from last year about this contest was massively popular. So, uh, here I go again. 2008 UPDATE: The 2008 Casting Call is now live. From October 1 through October 24, 2007, submit your favorite photo of your child(ren) for a chance for them to be featured in an upcoming babyGap or GapKids campaign. UPDATE: The Gap Casting Call entry period ended on October 24, 2007 (and please don’t email me personally, I can’t get your kid in the contest). Please go here on November 20, 2007 to vote for your favorite star models. UPDATE (11/20/07): The finalists have been announced, go to gap.com/castingcall to cast your vote. It’s been fun, but I am closing comments on this thread. Go here for the latest post on this topic. Thanks for pointing this out. Good luck to everyone who entered- they’re all adorable! Hi Christy, I was wondering same thing! From what I can see, the only place you can find your photo now is on your registered Kodak gallery page; at least until Nov 20 when they post the pics up for voting of the 20 finalists. I’m anxious to know if my son’s pics were entered, as I understand there was a 72 hr period in which pics were approved, then posted. Unfortunately, I entered mine 2 days before end of submission, which is probably why I couldnt find his either. I did email for a confirmation that my son is entered,but it’s 3 biz days til reply will be recvd. Look at it this way, the finalists will be notified by Oct 30, so if we’re not contacted by that date, I’ll keep trying. I didn’t get an email confirmation nor did I see my childs pictures on the website does that mean you never received them? Its not how they look or how they smile, its their personality that counts. Good luck to all you cute kids. I also want to say thanks for giving my child an opportunity to show the world the best of him. I also want to know where can I see my child’s pictures. Thanks again to gap and kodak for making this happen to a lot of kids in the world. I was just wondering if anyone had received an email or phone call saying their child(ren) is/are a finalist? I heard somewhere that today (Oct. 30) would be the day the family would be contacted…just wondering! I think this contest is so cute and fun…a chance to give your child such a great opportunity. I was wondering the same thing! Has anyone heard a thing from them? One day i saw the pictures being posted and then they were gone! Hello everyone, i am so anxious to know if anyone has been notified, there were so many babies to choose from. It said on or about the 30th for notification. I saw an article where the last years winners was emailed on Nov 1st telling her that her daughter was a finalist. So there is still hope. I have searched every search engine out there and no postings anywhere where someone said they were contacted. I don’t think anyone has been contacted yet for it would be on the net somewhere. Good luck to all, there is still hope! I WAS ALSO WONDERING IF ANYONE HAS HEARD ANYTHING AND ALSO IF YOUR CHILD DOES NOT MAKE THE CUT DO THEY SEND YOU AN E-MAIL SAYING THAT? I never got an e-mail about my two boys, but if someone did congratulations… To other parents don’t give up try again next year, i know i will. My boys belong in gap ads for sure. Au revoir. I was wondering the same thing. Good luck to everyone. If they haven’t contacted anyone the anticipation is a killer. But we have next year. Yes, I would love to know if anyone has been contacted. I’m out here in Hawaii and I feel a bit out of touch with everyone on the mainland. Good luck to everyone! Can’t wait to at least know that the notification has been put out. I thought the voting for the casting call took place on November 20th. On November 20, the twenty finalists will be announced and voting begins. It will be up to America to place their votes and decide who will be the next babyGap and GapKids models to be featured in a 2008 campaign. To see the finalists’ winning photos and place your vote, go to gap.com/castingcall any time from November 20 through December 15. The winners will be selected in late December and announced in January. Four children will be selected as winners of the Gap Casting Call — one baby girl and one baby boy for babyGap and one girl and one boy for GapKids. The winners will be featured in the windows of babyGap and GapKids stores nationwide and will receive other incredible prizes including an appearance on the Rachael Ray show, a year’s supply of babyGap or GapKids clothing, a KODAK digital camera prize pack and more! I submitted the photos of my 7 mo. old son later too and was not able to see them in the casting call gallery. I keep hearing so much conflicting information about notification though. Earlier today when I googled the babygap casting call, one of the websites was a gap website and it showed a baby boy (John David?? from NC, maybe?) and a baby girl as the winners. So, I’m confused. They could be last years though. Because I too was under the impression that starting Nov.20, America would be voting on the finalists. Where can i see my daughters pics.Is there a link where i can see my daughter if she have been entered in the contest enteries?? America will be voting on the finalists, but the photos they will be voting on are from the professional Gap shoot, NOT the submitted photos. Finalists have to go to CA on Nov. 13 for that shoot, so they have to notify really really soon if they haven’t already. There were almost 400,000 entries so I’m just guessing it wasn’t a member of any particular board. 20/400000 is really slim odds! has anyone heard anything yet are there any winners out there yet?????????? Please reply. Thanks. Havent recv’d an email or anything regarding the finalists. They were to be notified by the 31st of October to be flown to California Nov 13- 17 for the baby division, then the voting for the finalist would begin on Nov 20 after the older kids photo shoot. Good Luck to all sho submitted photos. My little girl pics were enter ,waiting for a reply. I know she cute and can do a good job for them, but so many cute faces! What a hard job they have!!! does anyone know of a number a website where you can see if they have notified all the finalists. i just want to know if it is over. the not knowing is killing me! I just sent an email to the contact us site will let you know as soon as i find out anything. ANYONE HEARD ANYTHING!!! HELP US!!! I must say this is too cute, how we are all so anxious to see if our super cute babies will be the next face for gap. GOOD LUCK everyone and please as soon as someone hears from GAP please let us know so we can stop checking our email 100 times a day. JUST RECEIVED AN EMAIL THAT THE FINALISTS HAVE BEEN CHOSEN AND NOTIFIED. THAT’S ALL THEY WOULD TELL ME. GUESS THERE’S ALWAYS NEXT YEAR. THANKS. Hope this helps any confusion. Gap is excited to announce the launch of its annual Casting Call Contest – a nationwide search for the cutest babies and kids to become babyGap and GapKids models. Gap is teaming up with KODAK Gallery, the leading online photo service, to invite you to enter babies (ages four and under) and kids (ages five to twelve) across the country in the Casting Call. From October 1 through October 24, 2007, submit your favorite photo of your child(ren) for a chance for them to be featured in an upcoming babyGap or GapKids campaign. Finalists and winners will receive prize packages including special gifts from babyGap, GapKids, KODAK Gallery and O, The Oprah Magazine. A panel of judges will narrow all entries received down to 20 finalists (5 boys, 5 girls, 5 baby boys, and 5 baby girls). Those finalists will be voted on by the public from November 20, 2007 through December 15, 2007. The children who receive the most votes in each category will be announced as winners in January 2008. I must say, it was a relief to find this and know that others submitted their entries. I found it to be very odd that they would only put up some of the pictures on the casting call for viewing. I almost panicked after trying and trying to view my kids’ photos. I honestly thought that this was a scam. They should have disclosed that some pictures may not make it to the casting call and I would not have been so worried. I think this was a wake up call to not trust websites and eblasts that come out with reputable names on it. It could have been a scam. Call me crazy but did it ever cross anybody else’s mind? Did anyone get an email from gap saying to make sure their contact information was right? Hubby got one, deleted it and is now unsure if it said anything else!! That was about a week ago. Wow!, I am really mixed up. I thought no one knew if they were a finalist until november 20. We weren’t selected in the GAP either:o( But, we did get one of the finalist spots in the Evenflo Baby You’re A Star contest sponsored by Babies R Us. Taylor is 1 of 10 babies in the running for the $10,000 scholarship, $1,000 suite of baby products, and to become the model for Evenflo’s marketing campaign. If anyone would mind, could you drop her a vote each day til the 15th of November? Do you think she has a shot at this? We’d really appreciate it… thanks so much! Click here to vote. I got an immediate autoresponse reply that said my e-mail has been received and I will receive a response in 3 days. To AMY: Hi..I followed your link to the Evenflo contest page. Is your little one the first one that comes up? I was going to vote, but I didn’t want to vote for the wrong one. They don’t say the child’s names, just where they are from. Just let me know and I will go back and vote. Thanks! ROSE – That was completely uncalled for. Every child is a beautiful gift especially to the child’s mother. Next time think before you speak. You may just be hurting someone else to make yourself feel better. Yes it would be wonderul if you’d vote, we really appreciate it! Taylor is the first baby on the page from Webster, NY! If anyone makes the Gap we’ll be sure to return the vote or for any other contest! Have a nice night!!! 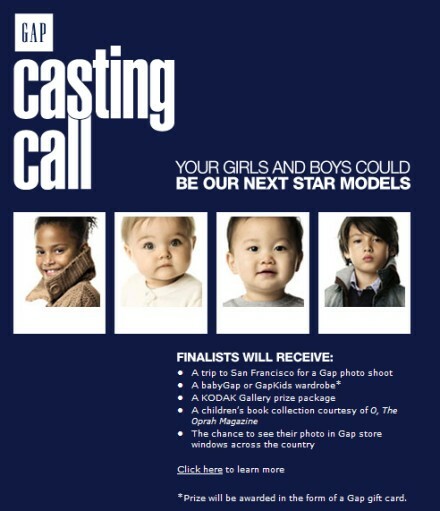 PS,, someone on the Cutekid.com is saying their child is a finalist from Gap, not sure if it’s true! can we still view the pictures of our children? Administrator’s computer is the official time keeping device for the Contest. So, it seems like they’ll still be notifying finalists until Nov. 19th. the information below is from the website above it states that phase 2 ends october 30 2007 so i guess whoever was contacted was contacted already. Q: When can I submit my childÃ¢â‚¬â„¢s photo? When will I have a chance to vote? TO AMY- FYI I voted for your baby girl, what a cutie she is. I also had a few of my co-workers vote. GOOD LUCK. Thank you for contacting us regarding the Gap Casting Call promotion. We appreciate your participation and enthusiasm! The 20 finalists have been selected and notified. We apologize but we are unable to release any information regarding the finalists. During the Voting Phase, Sponsors will post one (1) photograph of each of the twenty (20) Finalists. We invite you to visit the link below to vote on your favorite photos, beginning November 20, 2007 and ending December 15, 2007. You may visit the website and cast one (1) vote each day in each gallery, in each of the four (4) categories. As per the official rules, any attempt by any voter to submit more than the stated number of votes by using multiple/different email addresses, mailing addresses, identities or any other methods will void that voter’s votes, his/her Photo(s) (if any) will be void and removed from public voting and he/she will be disqualified from the Contest. Voters must be eighteen (18) years of age at the time of voting and legal residents of the fifty (50) United States (including the District of Columbia). Should you need additional clarification, or have any other questions regarding this promotion, please reply to this email. Sorry to all the mom’s for the comment I made above, I had my hopes up to!! 🙁 this is an email I just got from the baby gap contest. Do you moms have a life????? Anybody who would worry and be so obsessed about there kids winning this thing has issues. WHO CARES!!! Find something to do with yourselves and stop worrying about the Gap casting call. Bella is psycho!!!!! Mary – you are either not a mom or you lack excitement! Just because someone gets excited about one thing does not mean that that is the only thing in their life at the moment. Are you that linear that you can only get excited about one thing at a time in your life – how sad. Plus, our kids are worth getting excited about!!!! It would have been fun to see my kid’s picture in a Gap window and fly to San Fran with her and spend time at a photo shoot. If you don’t think that would have been fun then you are missing out. Thanks to all the moms who did the grunt work on this. I have been wondering all these questions for days myself and am thrilled to find a place with some answers. One more thing Mary – Don’t forget that you also found this webpage and spent time reading all these responses. So, either you are one of us looking for answers too or you have way too much time on your hands to read and respond to things that are not important in your life. The children chosen as finalists shouldbe heading to San FRancisco today or tomorrow so if you have not been notifed it’s over. I was under the impression that only the 4 selected finalist went to San Fran….all 20 are going to a photo shoot? I guess we will all know in a few days anyway! I have not been notified one way or another. Best of luck! I think all the little sweet peas are adorable!!!!! I don’t know how they would ever decide!!!! Hi Guys! Don’t you think if your child is not one of the finalists you should be notified? We are all going crazy wondering if our child was picked! I know I would have appreciated an email! Thanks for the vote Michelle- much appreciated! The voting closes at midnight if there’s any last minute mommies wanting to throw one or two votes Taylor’s way:o) I had lot’s of friends who entered GAP too – I am still shocked and greatful for Taylor being a finalist in Evenflo. Night all! FINALIST VERIFICATION/DISQUALIFICATION: Potential Finalists will be notified on or about October 30, 2007 by phone, email, and/or mail using the contact information given at the time of entry. Just so you know, everyone of us that has kids thinks that OUR kid is the cutest, why would we think any different, the truth is there are cuter kids than our own out there, but they are ours and we should thank our lucky stars that our kids are born without birth defects, or any major problems. “Cute” is just a bonus, good health is the miracle. My children were not pick either, but they sure are cuties! Amy – I tried to find the person on cutekid.com that was claiming his/her kid was a Gap finalist. I met all the finalists last week – can you send me the direct link to the post. I will know if the kid is a finalist or not. Maybe this mom misunderstood how the contest was working and thought the voting opened for all entrants on the 20th. Not sure, but good luck to your little guy! Wow PetiteFifi – I’m sorry you feel bad and resentful? I’m sure your child is beautiful. But you have to remember that there were over 800,000 entries. And I can tell you that the folks who were involved in choosing the semifinalists had no idea where the kids were from…all they had in front of them were the pictures, no information about the children, not even their names – just their ages. As well, even though we are from California, they still paid all of our expenses, including mileage and tolls, which I can guarantee you is NOT cheap here! It’s likely that a cheap flight would have cost them less then paying for our roundtrip drives and parking for 5 days in San Francisco (they reimbursed us for over $500 for our travel costs and we only live 2 hours away). So please, don’t take it personally. With that many entrants it’s all luck and all about what the particular people looking through the photos saw in the children’s faces. There is always next year, and many other contests to submit your child for. It’s been fun, but I am closing comments on this thread. Go here for the latest post on this topic.